Recently, I was asked to do a gift set for a baby shower. Two bibs, two burp cloths and a pair of baby booties. Unfortunately, the fabric choices for this set were all unavailable, so I had to dig through what I had. One of the flannels I had on hand was a Superman print, so that’s what we went with. At first, I wasn’t sure how it was going to turn out, but now that it’s done, I think it’s perfect! The bibs and burp cloths are reversible with terrycloth on the reverse side. 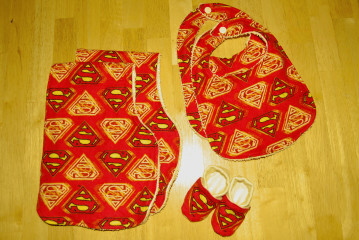 The burp cloths are shown folded in the picture, but they are a generous 8″ x 21″ with a contour for the neck/shoulder. The booties are approximately a size 3 (anything smaller and I’d go batty trying to make them!) and have little non-skid soles. I hope that the recipient enjoys them!